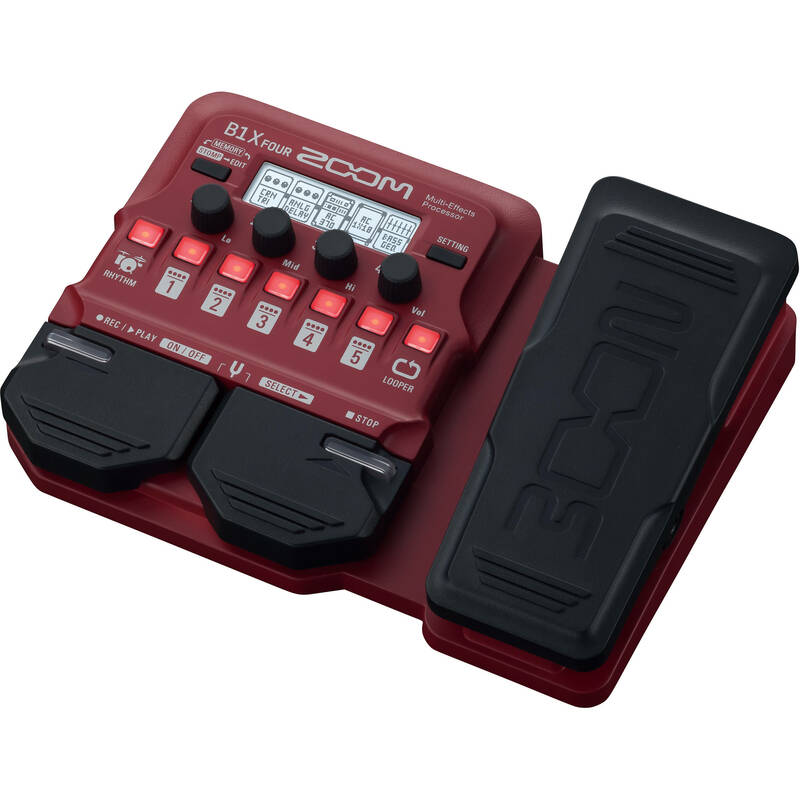 The Zoom B1X Four Bass Multi-Effects Pedal is a multi-effects processor designed for use with electric bass, giving you an expression pedal to provide continuously variable control over certain effects. Offered in an easy to use stompbox format, the B1X Four sports a wide selection of processes, amp emulations, and other features, such as an onboard 30-second looper and a chromatic tuner. With 68 built-in rhythm patterns, you can add drum loops to the mix, which can be quite helpful during looping. Distortion, chorus, and more are all on hand, as are 9 bass amp models that simulate classic combinations. Some effects benefit from the use of an expression pedal, so you can change the effect's amount in a smooth gradual way. You can tweak the pedal's operation in the digital realm through the B1X Four's display screen. Five effects can be chained at any time and in any order. You can save these effects in one of the 50 user-preset patches. Switch among patches (or banks of patches) quickly with the tap of a toe, so you can change your live or studio sound with ease. You can also change global characteristics to retain a sense of unity among patches. A three-knob tone stack and the overall output level knob do not change as you cycle through your sounds. The pedal sports over 70 different effects, and you can edit or add more effects from your computer too. Simply hookup the pedal to your Mac or Windows machine over a USB cable and add effects from Zoom's Guitar Lab software. The B1X Four provides one 1/4" instrument input, one 3.5mm input for mobile devices and media players, and a combined amp/headphone output. The unit runs on four AA batteries, giving you up to 18 hours of runtime. You can also power the unit with a dedicated ZOOM AD-16 AC adapter, or over USB.